Cottage close to Madaket Beach. 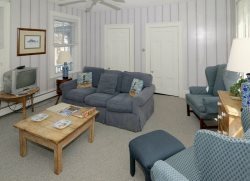 Cottage close to Madaket Beaches. Just one block off Madaket Road. Large backyard and great for children. In the event of cancellation, and the accommodation is re-rented for the rental period at the same rate, all payments will be refunded, less a 15% cancellation fee. In the event the accommodation cannot be re-rented for the rental period, the guest is responsible for the full rental amount, or the difference if the accommodation is rented at a lesser rate. Ask a Nantucket Accommodation's reservations agent about travel insurance which will cover cancellations in certain conditions. Our $60.00 service fee is non-refundable.